I heard $3 billion is spent at garage sales in the US each year. That's a lot of quarters! Well I'm gonna be 50 (gasp) next year and I like the mirror too! It's unusual and cute! Great finds! I really like the white candlesticks. 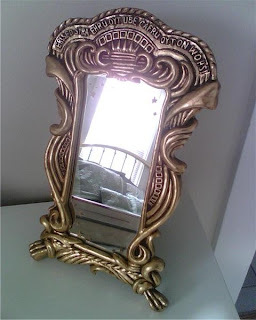 I think I like the mirror the best, of all your finds! You're right, it's unexpected, and that makes it cool! You found some great items. I love that glass pitcher! 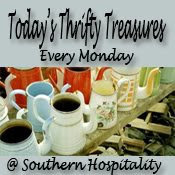 Very nice thrifty finds! So glad you joined the party this week. Nice finds! We are always losing pizza cutters (??!). Thanks for the visit! Honestly, as a 36 yr old HP fan, I think the mirror is cool. And 2 bucks wasn't bad either! Anny, You cracked me up calling the light fixture a "bulb covery thingy!" You paid so little for a lot. I especially like your whimsical mirror and the clock! Thanks for stopping by. Love that mirror and I'm 51! We use kitchen shears to cut pizza at our house--never had much luck w/ pizza cutters. I have got to try garage sale-ing. The bargains are amazing. I love that HP mirror! You got a lot of cute goodies for great prices. Great prices on everything. I like the mirror too and I'm 60 something " : )) The glass pitcher looks interesting. That mirror is so interesting, I love it! I like the glass pitcher a lot too! Thanks for stopping by my blog :-) Nice to "meet" ya! the mirror is my favorite! Definitely, is it going to get a makeover or will you keep it as is is?